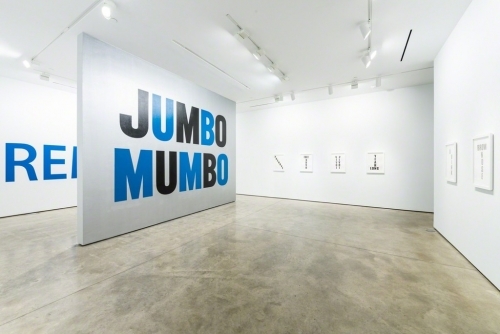 Kay Rosen solo exhibition Jumbo Mumbo at Lora Reynolds Gallery, Austin, TX. Lora Reynolds is pleased to announce Jumbo Mumbo, an exhibition of paintings and drawings from 1985 to 2016 by Kay Rosen—the artist’s first presentation at the gallery. Kay Rosen makes paintings, drawings, videos, prints, and collages of words. The crisp, flat precision of her small works on paper or canvas belie their freehand (never silkscreened, never stenciled) execution. She makes monumental wall paintings too, two of which are in this show. Whatever the scale, Rosen’s compositions usually feature just a single, ubiquitous word—and only rarely more than a short common phrase. But by encouraging non-linear, unfamiliar ways of reading (e.g., by painting the various components of a word in different colors, stacking or aligning letters in unconventional ways), Rosen’s paintings become reflections on culture, history, politics (and the ways we use language) and are almost always simultaneously funny and poignant. One of the wall paintings in Jumbo Mumbo is the word REMOVAL in blue, four-foot-high type. Rosen italicized only the last four letters of the word and titled the mural Removal From Office. Without referring to any specific person, this piece uses an architectural metonym (the Oval Office) to bring to mind the tradition of the American presidency, its potential for divisiveness, and the people’s sometimes rancorous (sometimes overeager) calls for impeachment. But having been first conceived in the election year of 2008, the painting also refers to the constitutional mandate of a peaceful transfer of power at the end of the President’s term. Trained in languages and linguistics (but never officially art), Rosen is uncommonly sensitive to even the smallest components of language. When reading or writing or speaking, she stumbles across words within words and sometimes even entire dramas within single letters. She dissects and analyzes sounds, grammar, and typography. We assume these systems—like the alphabet—are merely abstract, each unit meaningless on its own until combined with others to form words, sentences, and express ideas. Rosen, however, identifies subsystems outside of those we typically use to create meaning—like in the bar of a T or the dot of an i. In H Is for House, a wall-sized H becomes a two-story building, its crossbar being the ceiling/floor between two stacked spaces/rooms. Flipped on its side, the H is now a one-story ranch-style home, its crossbar (now vertical) a dividing wall between two adjacent chambers. In Rosen’s hands, letters and words are not always just signifiers—they can function more like the signified, “like little objects, actors, or performers,” as she says. And when she pairs an upright H with one on its side, thoughts about socioeconomics and wealth disparity are not far off. This inability of language to be absolute, certain, or consistent means it is endlessly manipulable. Powerful people—whose voices can be heard—know this better than anyone. Words can be seductive, induce fear, or be persuasive enough to make you believe something perhaps you should not. And yet Kay Rosen’s acrobatics demonstrate how pleasurable, delightful, and full of surprise language can be. It is the means by which we engage with the world and connect with the people in it; it facilitates empathy. Some of Rosen’s paintings sympathize with the struggles of a particular social group—American Indians, Latinos, blacks, women, gays, transgender people—which, together with her works that point to politics, reveal the artist to be a civically minded person who simultaneously believes in and is deeply skeptical of government. Again and again, Rosen reminds us language is the vehicle of revolution, of change. And change, as Heraclitus observed 2500 years ago, is life’s only constant.